Bus surveillance video shows a Florida mother fighting her son's alleged bully on the school bus. WESH's Stephanie Kolp reports. Felecia Phillips was arrested after getting into a fight with a 17-year-old student at a bus stop in Bunnell, Fla.
A Florida mother who faces child abuse charges after a school bus brawl was caught on camera says she has no regrets about going after a teenager she says was bullying her son. "I mean, I really, honestly can't say I won't do it again," Felecia Phillips, 35, of Bunnell, Fla., told NBC Orlando affiliate WESH.com of Wednesday morning's fight. "I just wanted him to leave my son alone, you know? What's the problem?" The trouble began on Tuesday, according to Phillips, when her 15-year-old son, Terez Smith, got beat up at Flagler Palm Coast School by a friend of the teen she confronted on the bus, 17-year-old Justin Mickens. Worried about her son's safety, Phillips decided to accompany Smith on Wednesday to the bus stop. Before the students even got on the bus, Phillips and Mickens began to argue, and Phillips pushed the teen, witnesses told deputies. Phillips believes Mickens was behind the attack on her son. "Words kept going back and forth or whatever, and he called me out," Phillips said. "And I smooshed him in his face or whatever." Mickens slammed Phillips to the ground as the bus arrived, deputies said. Phillips then allegedly followed him onto the bus, grabbing his hair as the bus driver yelled that she needed to get off the bus and other students tried to stop the brawl. "She chased me on the bus and pulled me by the back of my head," Mickens told WESH.com. "I don't even talk to her son. I don't even hang around him ... None of that ain't true." Phillips was arrested and charged with child abuse and trespassing on school property. Her bond was set at $2,500. 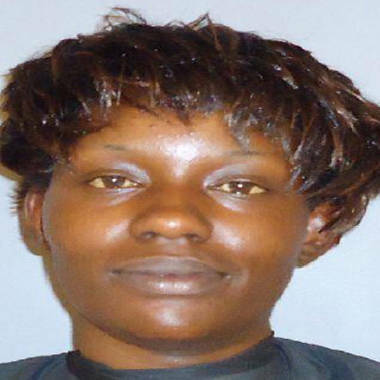 After paying bond, she told Florida's News4Jax.com she felt Mickens got what he deserved. "That's what they need; a good old-fashioned whooping," she said. "We're not able to do that because we end up in jail-- child abuse charges." Mickens is not currently facing any charges, Debra Johnson, a spokeswoman for the Flagler County Sheriff's Office, told NBC News on Thursday. When he pushed Phillips, he was acting in self-defense in the deputies' opinions, she said. Phillips' son, Smith, defended what she did. "I feel great about it because I know a lot of people wish they had a mom that had their back," he told News4Jax.com. "Some parents, when you tell them, they just ignore it." Smith is just looking to get an education, Phillips told 10 News in Tampa, and she didn't feel bad about confronting the boy who was "messing" with her son. "I don't want anybody picking on him, and messing with him. Leave my son alone," Phillips said. "He's not looking for trouble. I don't even raise my kids that way. He's not messing him, why are you messing with him? So no, I don't regret it." The Flagler County school district discouraged other parents from dealing with bullying in the fashion that Phillips chose to. "While we encourage parents to be involved in their students' education, we don't encourage parents to go onto buses. Buses are really for students only; parents are certainly welcome to speak to bus drivers through the window, through the door, but they shouldn't come on buses to handle incidents like that," Mike Judd, senior director of school operations for Flagler County public schools, told NBC News on Thursday. "If there's a problem they either need to contact law enforcement or school administration, but they should not take matters into their own hands," he said, adding he didn't know if Phillips had reached out to authorities prior to Wednesday's altercation.